Taste the wonders of green tea. 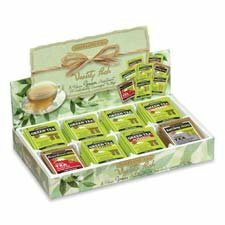 This green tea assortment kit offers you eight individually packed varieties of this classic tea. You can choose from green tea, green tea decaffeinated, Constant Comment green tea, green tea with mint, green tea with lemon, earl grey green, green tea with peach and green tea with mango. Rich, high-quality teas are the perfect choice for the office and tasteful enough for after-dinner party service. Beverage Type: Green Tea Flavor: Assorted Packing Type: Box Capacity Weight: 3.05 oz.